Nine Chinese fishermen will go on trial this week in the Philippines for allegedly poaching in Filipino territorial waters and catching a protected turtle species. Their arrest has angered the Beijing government, which says the fishermen were in China’s territory. Some analysts say the trial highlights the ongoing tensions in the South China Sea. 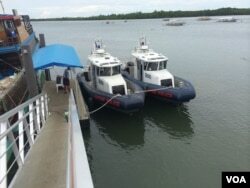 The Philippines’ National Police Special Boat Unit patrols the waters around the island province of Palawan. The United States gave Philippine authorities six fast ships to help fight various types of crime, as the unit’s captain Osmundo Salito explains. “Narcotics trafficking, human trafficking, terrorism, piracy, smuggling, poaching and other forms of criminality,” said Salito. That includes catching foreigners illegally fishing in the Philippines’ territorial waters. Anchored at the dock of the Special Boat Unit’s station is a 30-meter long ship. The maritime police say they picked up its crew of 11 Chinese nationals as well as 5 Filipino accomplices while catching endangered sea turtles. They were found in waters near the Half Moon Shoal in the South China Sea, in an area of the Spratly Islands claimed by both the Philippines and China. The capture of the Chinese ship in May prompted Beijing to ask Manila to immediately release the crew and their ship. A spokeswoman warned the Philippines not to take any provocative actions. But Philippine authorities pressed charges against nine of the ship’s adult Chinese fishermen. They will go on trial later this week and if convicted, they face between 12 and 20 years in prison for violating a protected species law. This follows a ruling last month, in which a Palawan court found 12 other Chinese fishermen guilty of poaching in a protected coral reef zone. Those men were sentenced to between 6 and 12 years behind bars. Palawan’s chief prosecutor, Alen Rodriguez, said they are not specifically targeting Chinese fishermen, but claims all of these men clearly broke Filipino law. “There is overwhelming evidence and we can just not turn the other way and let them leave. I am confident we will get the conviction,” said Rodriguez. Tensions are high throughout the South China Sea. Earlier this year, China attempted to build an oil platform in waters claimed by Vietnam. The Philippine navy said Chinese forces try to block its' supply ships. And recently, Washington said a Chinese fighter jet confronted one of its own planes in airspace over the sea. Some observers in Manila say the frequent maritime violations by Chinese fishermen are an example of Beijing’s territorial expansion plan. Rafael Alunan, a former Philippines Secretary of the Interior, says the fishermen are just a proxy for the Chinese military. “The fishermen are part of the salami slice strategy of China. They are using their fishing fleets, fishermen, their civilian ships, to poach, occupy, reclaim. They’re using their civilian assets and the fishermen are at the vanguard,” said Alunan. Alunan said that while dialogue can help offset some of these tensions, Manila must also show strength against what it sees as Chinese aggression at sea. Prosecutor Rodriguez said that if the 9 Chinese poachers are convicted, it does not seem likely they will be granted a presidential pardon as some other foreign fishermen received in the past. “In the past, during the time of President Arroyo, she issued pardon to some Chinese fishermen and [they] were allowed to go home. But under the Aquino administration, I have not heard of such [an] incident at the moment,” said Rodriguez. Rodriguez expects the trial of the fishermen to conclude by the end of September.